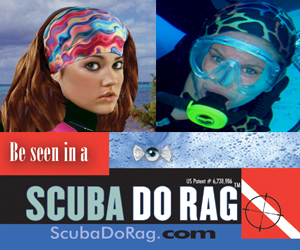 Our most popular and, by far, most requested ScubaDoRagTM returns for a limited engagement in time for patriotic fervor, sporting events and, of course, being seen underwater. It has truly been a nationwide effort getting the two different fabrics printed – stars printed in the West and stripes in the east. WHAT DO BOY SCOUTS, BIKERS, FOURTH OF JULY AND SALMA HAYEK HAVE IN COMMON? Blimey! ScubaDoRags Have Gone Limey!